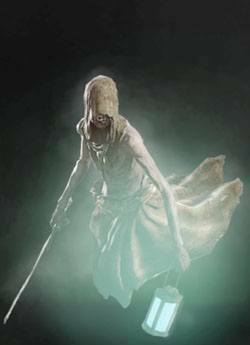 Wraith is an Creature/Monster in The Witcher 3: Wild Hunt. Clerics and scholars are forever debating whether spirits do in fact journey to another world after death, one where eternal joy or suffering awaits. Both groups agree, however, on what happens to spirits who, for one reason or another, remain in our world after their body breathes its last: they transform into wraiths. To hear their mournful howls, one can surmise this is not a fate to be envied." Wraiths are very dangerous in large groups, however their tendency to drift and wander aimlessly makes them relatively benign at a distance in most cases. This allows the opportunity to confront wraiths in relatively small groups. Wraiths are completely immune to the shock of Samum, though they can be stunned for brief periods using the sign of Axii. They are incredibly resilient to fire and high temperature extremes making Dancing Star and the sign of Igni largely ineffective, however more explosive concoctions such as Grapeshot can be quite useful. They are also immune to the effects of Devil's Puffball and other poisonous gases and it stands to reason that they are immune to the effects of poison altogether. Though high temperatures seem to have little effect, it should be noted that extreme cold, such as those from Northern Wind, can freeze a wraith solid. A key attribute of a wraith is its ability to walk the line between the ethereal and the material planes allowing them to effectively become intangible whenever they choose. The magical effects of the Yrden Sign as well as the allergenic reacion to the silver found in Moon Dust can be very useful in preventing a wraith from becoming intangible, forcing them into a fair fight. Despite their magical properties, wraiths appear to be largely resistant if not entirely immune to the effects of Dimeritium. A wraith at close range will strike with supernatural strength, but is quite slow compared with the reacion time of a Witcher, making these strikes easily parried or even dodged altogether. The danger comes when a wraith vanishes, becoming immaterial and invisible. Most often a wraith will choose to reappear directly behind its target and strike quickly, violently, and repeatedly. The first of these strikes may be parried, but even a Witcher is unlikely to fend of the repeated attacks of an enraged wraith. Therefore, it is best to dive roll out of the way or perform multiple pirouettes to evade these swift and deadly strikes. It is recommended to coat your silver sword in Specter Oil before any predictable engagement with multiple wraiths and to be quick and light on your feet. To protect against some of their more unprodictable strikes, it is recommended to use the sign of Quen. With Quen you can afford a more reckless assault. Take down the wraith quickly with your silver sword. You'll likely lose less health this way then when trying to dodge and counter their teleport attacks.